The other day Aaron and I spontaneously decided that we were tired of having certain rooms in the house sitting unfinished. We have lived in our home for 3 and a half years now and there are certain projects that have just never been completed. I'm sure all of you home owners out there understand...despite your best intentions, life gets in the way and things just get pushed to the side. So, the other night, we did a little online furniture shopping on overstock.com! We have had our master bedroom mattress and box spring sitting directly on the floor without a proper bed frame since we moved in...man that was embarrassing even to type haha. You see, our bedroom set was purchased from a individual who collects Mid-Century Modern pieces, and in that era, king size beds were not common...so the frame that came with our set was for a full mattress actually. Not going to work. This couple needs all the space they can get - Aaron is a big guy, we both spread out when we sleep, and we have two 80lb dogs that insist on laying with us from time to time (or almost always lol). King size is the only option. So we have casually been keeping our eye out for something the might work, and match with what we already have. The other night we found this Nixon frame, both liked it, and basically decided on the spot to order it! Once we got started, we couldn't stop. 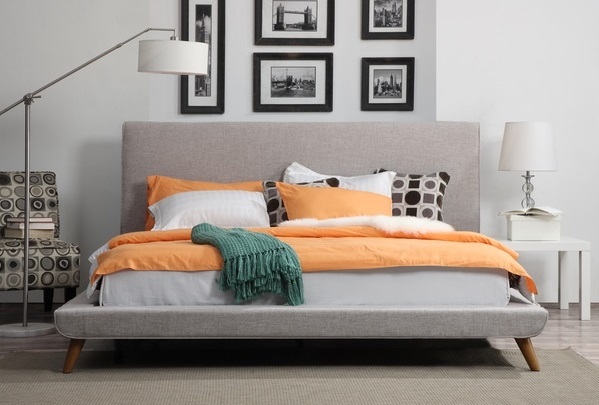 We also ordered this simple grey linen frame for the guest room (who's mattress is in the same predicament as our master bedroom - excuse me while I die of shame). 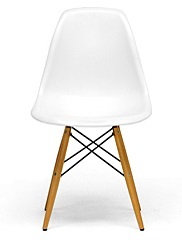 The final item(s) we ordered are 4 chairs for the dining room. Same issue - we got our dining set from an antique shop and the chairs need fixed, and we have never gotten around to it (it's been almost a year - we've been eating at the counter on stools - haha it just keeps getting worse). Aaron picked these out on his own, and when he told me he had already ordered them, I was nervous...but I have to say, I'm very impressed and super excited to put these around our maple table!